... Perkins Park on the Killesberg. Perkins Park is a well-established club. The building was built in 1939 and was used as an event location for the Reichsgartenschau (horticultural show of the Reich). The continuation on the other could read as follows: "... weit. wer sich verirrt kommt verloren." (... far. who gets lost goes astray.) I haven't the vaguest notion of the letters which were left over. I hope the park management will initiate a systematic cleaning of that sculpture. It looks kinda aesthetic. This panorama picture was made from 4 images. On the left there is the overhead hopper on the Pragsattel. Almost in the middle of the picture you see the Bülow tower. The white buildings right from the tower are part of the well-known residential area named Weißenhofsiedlung (I'll report about it later). You see the development area at the top of the photo? In former times there were the exhibition halls on the Killesberg. Now an apartment and business complex is under construction there. A local resident told to me that she is happy about the new buildings because of the shopping and medical facilities. By the way. The new exhibition halls are situated next to the airport. This filligree-looking look-out is situated in an area named Höhenpark Killesberg. There are 4 observation decks and 170 steps to go overall. My wife Judith and Felix have waited about while I was climbing the tower. The station in Feuerbach. It's an impressive building. I like its symmetry very much. In front of the station run the tracks of the city railway lines U6 and U13. Believe it or not. This neo-baroque church was built from 1990 to 1995 and it is named St. Mariae Himmelfahrt. The churc is owned by the German division of the Society of St. Pius X. ... to present you some selected impressions from yesterday's carnival parade on Shrove Tuesday. I've made more than 160 photos. I didn't make the decision easily. There were mysterious figures on the way. Young girls have proven their capabilities. I assume that they have kept working hard for this day. Music way played by several bands. Some of the figures had a soft spot for the children. This small chapel stays in the shadow of a great modern building. I hope they don't agree like cats and dogs. A view into the adytum. The 'Killesberg' area in the North of Stuttgart is a famous local recreation area. There are many walkways, trees, small allotments and refreshment places like this 'Biergarten'. It looks more welcoming than yesterday's beer garden. I promise I'll visit both places. I made this photo in Feuerbach at a busy street. What do you think about this 'Biergarten'? Isn't it welcoming? Would you like to drink a beer there? OK, it's winter and not the right time for visiting a 'Biergarten'. Just as well it could be a refreshing place in spring or summer. This compact tower is situated at the bus terminal in Feuerbach. The winter has taken a break in the moment. Greyness has got the upper hand. It's really not the best weather for a photographer. PS: David, an attentive follwer, has informed me that the tower at the bus terminal in Feuerbach is a bomb shelter like the Bosch tower at Pragsattel. Thank you David. Winterly view from a panoramic lane in Mönchfeld to Mühlhausen, Hofen and Neugereut. This is the winterly Mönchsteinplatz. There is the Catholic church in the background. Can you decode the informations? I've seen this fancy parking place in Rot. This is a detailed shot. Unfortunately a car was standing in front of this wonderful artwork. I hope you can nevertheless recognize the lovely putti and trees. View from a frozen field to the railway overbridge near Zazenhausen. Some steps downward I made this shot. It shows Zazenhausen which is a part of Zuffenhausen. The overhead hopper at the Pragsattel is artwork and information board. But the building was also modernized and upgraded for protecting the civil population in case of a catastrophe. Free of any catastrophe you can drink a beer in a tavern at the foot of the hopper. Cheers! Oh Lord Won’t You Buy Me A Mercedes-Benz! This building at Heilbronner Straße should be your first destination before you'll be in finance negotiations with the Mercedes-Benz Bank. If these cars are exorbitant you also could go to car dealerships which offer solid French or Japanese cars. This is the building of the "Mercedes Benz Bank" in all its glory. This impressive doorway belongs to a more impressive building. If you would buy a Mercedes Benz car you should ask this financial institution for favourable conditions. View from a bridge over the busy Heilbronner Straße. 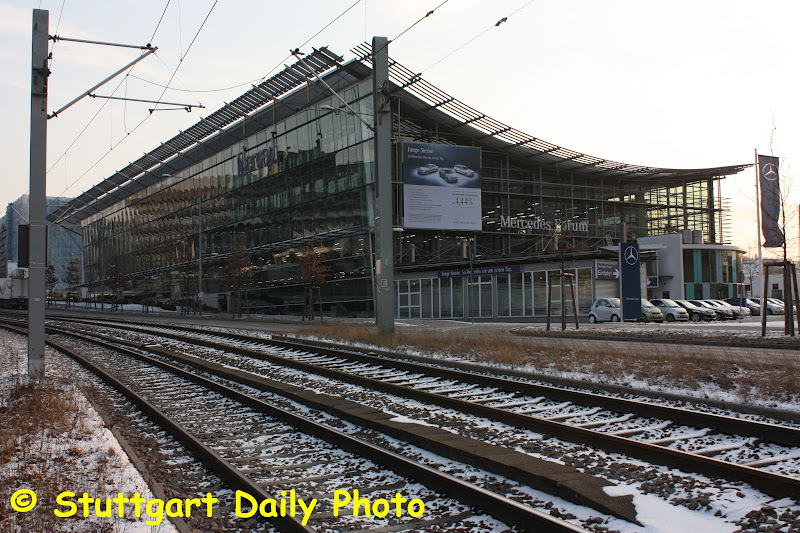 Have you noticed that the winter has Stuttgart under control? There is only little snow in town but it is very frosty in the moment. Felix has escorted me again for a short photo expedition in Rot. We walked across a small park between Rotweg and Haldenrainstraße. It was stone-cold and no other soul was in sight. View to an old house through a frame of a petrol station's billboard at Heilbronner Straße. This old house looks like a fractured tooth in an otherwise healthy denture. Das "Penthouse" ist nicht nur eine bekannte Diskothek in S-Feuerbach, sondern auch Restaurant und Lounge. Am Tage sieht sie recht unattraktiv aus. Ich werde wohl mal tüchtig vorschlafen und mal einen netten Abend hier verbringen. The "Penthouse" is situated in Feuerbach. It's not only a well-established discotheque but also restaurant and lounge. The building isn't a vision of delight in the daytime. Therefore I've to sleep in advance to spend an enjoyable evening there. Dieses Panorama-Bild ist aus 4 Photos entstanden, die ich aus einem Fahrstuhl heraus gemacht habe. Unten ist die vielbefahrene Heilbronner Straße, dahinter Feuerbach. This panorama picture was made from 4 photos which I've made from an elevator. The busy street named Heilbronner Straße is at my feet. There is the Feuerbach district behind the street. Die Außenfahrstühle des NORDTOR PLAZAs haben es mir angetan. The external lifts of the NORDTOR PLAZA building have taken a shine to me. Der 1. Juni 2011 stand unter dem Motto "Im Bau". Da zeigte ich ein Bild aus der Lautenschlager Straße in S-Mitte. Vor ein paar Tagen sah es schon so aus. The motto was "Under Construction" last year on June 1st. 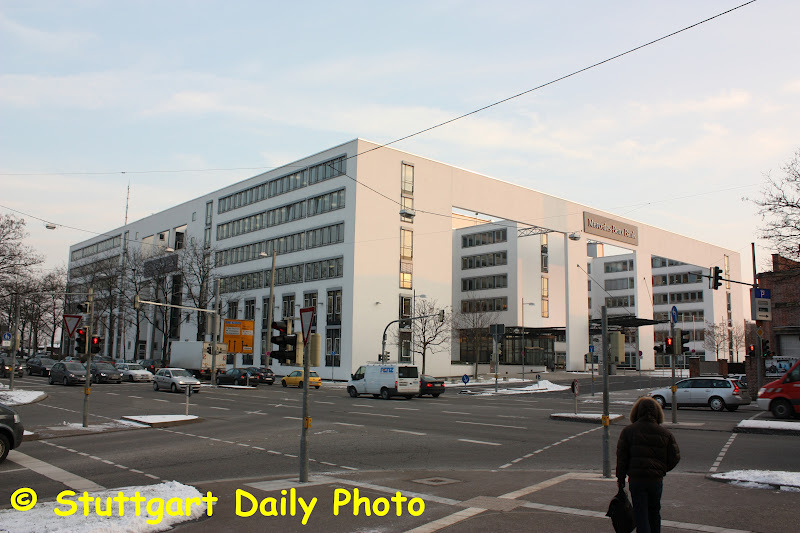 I've published a photo of a building lot from the Lautenschlager Straße in the centre. The today's photo shows the situation some days before. The people of Stuttgart love their feathered friends. They give them bread, grains and nuts. My photos were made in the lower Schlossgarten near the city railway station named "Mineralbäder".